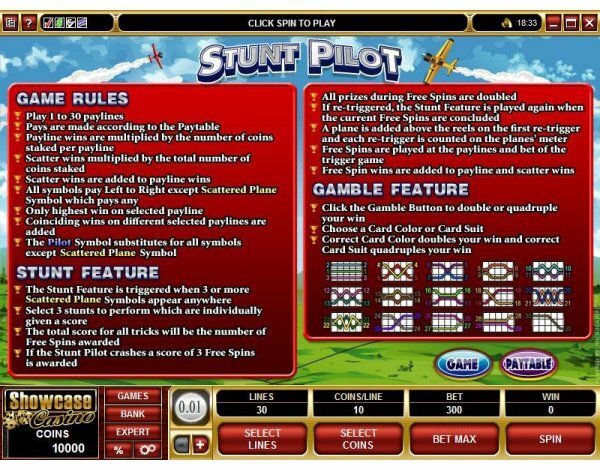 Overview: April 2009: It's chocks away and off into the wild blue yonder with STUNT PILOT. This 5 reel, 30 pay-line game presents you with several different winning opportunities through an absorbing mix of Scatters, up to 30 Free Spins at a time, with prizes doubled and re-triggers possible and a uniquely innovative bonus feature. 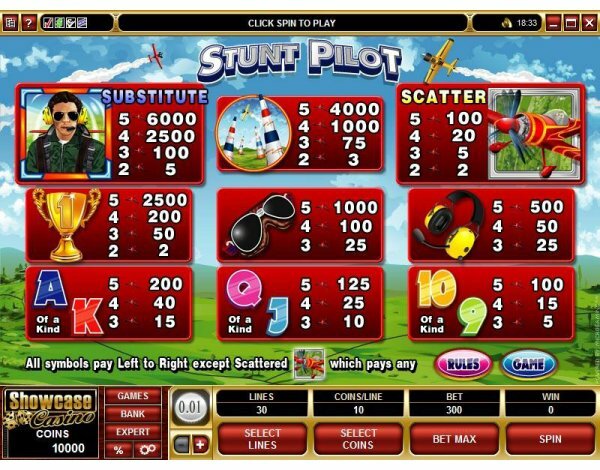 But if the stunt pilot fails and crashes, the player receives only 3 Free Spins. 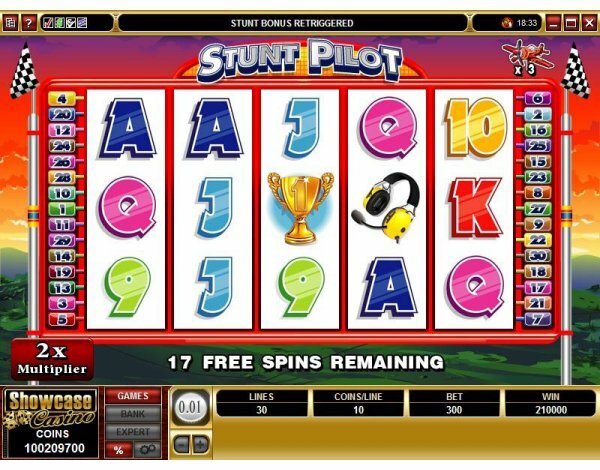 The Free Spins, which activates after each stunt bonus feature is completed, are almost a game in themselves, doubling prizes and re-triggering more Free Spins during the original Free Spins. And capping a great airborne thriller is the Gamble feature, you can double or quadruple their winnings if you correctly predict the color or suit of the cards. 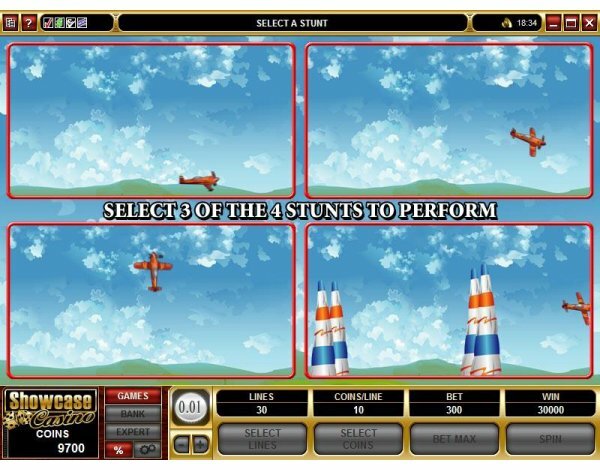 The animated graphics in this outstanding game deserve a special mention, creating a colorful and dynamic theme with symbols typical of the exciting sport of aerial racing and aerobatics. 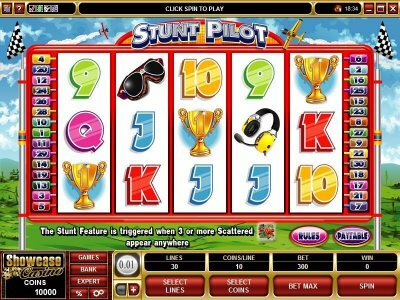 Similar Slots: If you like Stunt Pilot, you might like these other 5-reel slot machines: Age of Discovery, Jolly Jester, Jonny Specter, Monsters in the Closet, Silver Fang, Twister.